FORTUNE -- More than seven months after it was handed down, the Supreme Court's ruling that rolled back limits on corporate participation in elections remains mired in controversy. Last week, Goldman Sachs (GS, Fortune 500) made news after it announced it wouldn't spend any corporate funds directly on political ads. The surprise decision means the firm will voluntarily steer clear of the giant loophole the high court opened in the Citizens United v. Federal Election Commission case when it struck down a century's worth of restrictions on those types of expenditures. A few days later, Target (TGT, Fortune 500)'s chief executive Gregg Steinhafel wrote employees to apologize for a $150,000 contribution the retail giant made to a business group backing a conservative gubernatorial candidate in Minnesota. After the group disclosed the contribution in a state filing, gay rights groups and other left-leaning organizations had expressed outrage at the donation -- made possible by the Supreme Court ruling -- since the candidate has been a vocal opponent of gay-rights initiatives. Steinhafel said the company would set up a review process to screen future contributions. To some campaign finance reform advocates, the twin developments confirmed the pressures facing major corporations trying to navigate in a newly unrestricted environment. But they also underlined a bigger problem: trade associations and other non-profit groups can now spend freely on ads attacking or supporting specific candidates. And because those groups don't always have to identify their funders, they provide a safe vehicle for corporations looking to launder their involvement in dicey election contests. In other words, Goldman Sachs can publicly say it won't fund political ads and still go right ahead doing it privately. Reform advocates, keying off an argument in the Citizens United decision blessing disclosure, spent the spring and summer pressing for a legislative fix that in part would have forced third-party groups to name the funders of their ads. Called the DISCLOSE Act -- Democracy Is Strengthened by Casting Light on Spending in Elections -- the measure passed the House but collapsed in the Senate late last month against uniform Republican opposition. Now, an array of activist shareholder groups and like-minded advocates are stepping into the breach, trying to compel the biggest companies to willingly adopt transparency standards for their political programs. The high water mark of that standard -- set by the Center for Political Accountability, a Washington, D.C.-based group spearheading the effort -- is board oversight of political expenditures and voluntary disclosure of payments to outside groups. The push began about seven years ago, but it appears to be reaching something of a tipping point. In April, advocates marked a milestone when they convinced the 50th company in the S&P 100 to agree to the disclosures. Wall Street remains a pocket of resistance, and advocates have set their sites on Goldman in the hopes that if it comes aboard, other financial firms won't be far behind. There was evidence of that last week, when, following Goldman's pledge to forego direct political expenditures, Bank of America (BAC, Fortune 500), Citigroup (C, Fortune 500), and Wells Fargo (WFC, Fortune 500) confirmed they would abstain as well. So far, only a handful of financial firms have agreed to fully disclose their activities, including American Express (AXP, Fortune 500), Capital One (COF, Fortune 500), and US Bancorp (USB, Fortune 500). 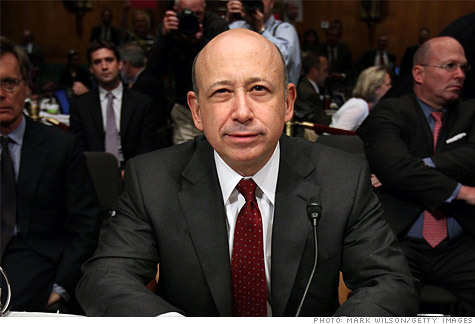 Advocates started pressing Goldman on the disclosure standard last year. Then, for the first time, Goldman shareholders voted on a proxy resolution that would have forced the firm to disclose its payments to trade associations and other outside groups. It garnered 22% of the vote. This spring, that number jumped to 37%, according to Adam Kanzer, managing director of Domini Social Investments, who filed it. Of Goldman's decision to forego direct political expenditures, Kanzer says, "To be honest, it's not very significant," because the firm was never likely to sponsor that kind of spending, lest it risk a public backlash. Routing funds anonymously through a trade association, however, remains a tempting option -- one that Kanzer argues the firm should pass up. "Goldman needs to be in a position to rebuild its reputation right now, and I don't think they can do that if their political activities remain in the dark." Bill de Blasio, the New York City public advocate who led talks with Goldman to get them to swear off direct contributions, acknowledged a growing sentiment on Wall Street that such spending represents a Pandora's box. The next step, he said, is compelling them to disclose their payments to outside groups. "We really respect what Goldman Sachs did on Citizens United, but we've been clear with them that we're going to keep coming back on trade association payments," de Blasio said. As the number of companies agreeing to the transparency standard piles up, shareholder activists are trying to create a sense of inevitability around its universal adoption. Bruce Freed, president of the Center for Political Accountability, said in the last proxy season that the average vote on the transparency resolution was 30.7%, triple the average seven years ago. "The pressure builds on companies to take this step, so it's just a matter of time," he said. Microsoft (MSFT, Fortune 500), a newer convert, came aboard after Newground Social Investment filed and then withdrew a shareholder proposal in 2009. Newground chief executive Bruce Herbert said some companies argue the disclosures put them at a competitive disadvantage. "We counter that it's fast becoming a corporate governance best practice, and there is the risk for reputational damage if they don't," he said.